Rushing the passer has been a weakness on Notre Dame’s defense for the majority of the last 20 years. 2018 was different and the improvement with getting to and affecting the quarterback was one the main catalysts that sparked them to a top-5 finish in the S&P+ defensive ratings. That type of pass rush needs to be the rule rather than the exception in order to continue to play elite defense. The best way to do that is to continue to sign and develop defensive linemen who have the traits to be excel against the pass. The Irish just landed a commitment from a player who has those traits. 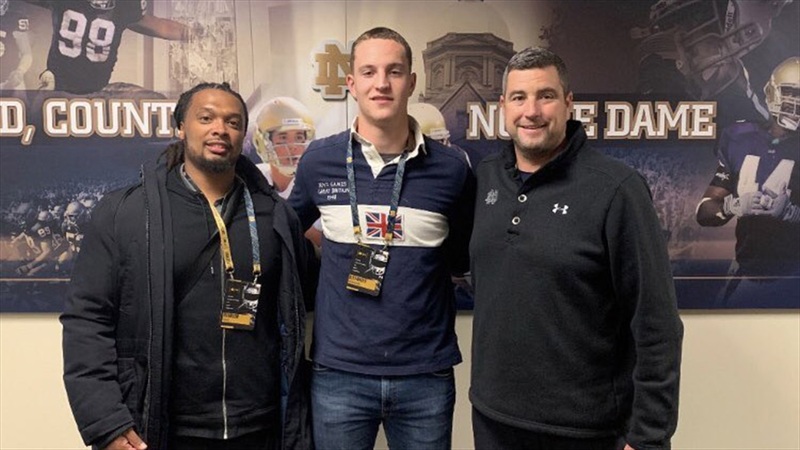 Alexander Ehrensberger‍ might not fit the profile of a prospect that Notre Dame typically recruits, but the prospect from Germany has atypical athleticism for someone his size. That is what make him such an exciting addition to the 2020 class. Ehrensberger has twitch. Some guys are big and have frames like him and they can’t get off the ball. Not Ehrensberger. He has a very good first step and attacks like sprinter out of his stance. This quick arm over happens before the tackle even pops up. He’s a very good athlete that can bend surprisingly well for someone that tall. He has the ability to turn the corner, finish, and he is a high effort individual. While he still has work to do with his hands, the way he works through the shoulder of this tackle is impressive. He is working an edge rather than running around the block and he even finishes with a nice rip move. Lateral quickness to me is one of the things that can help a good pass rusher become a great one. Ehrensberger can explode laterally like he does on this rush. It’s like a point guard crossing someone over and taking a defender to the hole. I love it because it’s decisive and usually when you see someone who hasn’t been exposed to the game for as many years as most kids in America, they are tentative and unsure. That’s not Ehrensberger and that’s very encouraging to see he already has that in him. He is understandably raw in some areas of his game. While he is almost freakishly long, he doesn’t know how to use that length to his full advantage yet. This play shows a glimpse of what he will be able to do if he can establish a punch out of his stance. Ehrensberger using a long arm while converting speed to power could be scary if he masters that. He needs to learn to disengage and get off blocks quicker. A lot of that is just experience and knowing what blocks are coming his way and what that means about the play he is facing. It’s the kind of thing that can come with time and for some people things progress quickly. For others it can take awhile and he’ll need adjust in order to be a factor versus the run. The good news is that he shows natural strength and he has the frame to add quite a bit of weight. He’ll have to when facing much better competition than what he is facing now, but the raw tools are there for him to be able to handle it. I think you can tell that I believe Ehrensberger has an extremely high ceiling. Guys that are 6’7” that are as quick as him and can run like he can are rare. Although he will have a lot to prove in order to show he can become a contributor at Notre Dame, what I see on film from him as an athlete makes me believe he has the talent to become not just be good, but great. The raw part of raw tools is there for a reason, though. Someone like Margus Hunt, an Estonian track athlete that started football in college at SMU, is an example of a player who was able to translate those tools into an NFL career. I see that same kind of potential with Ehrensberger and he already has a head start on Hunt. He’s not someone I would expect to make an impact early in his career, but I believe he has the potential develop into a quality starter late in his career if Mike Elston and Matt Balis can help him put it all together at Notre Dame.